We all know and admire the films by Markku Lehmuskallio and Anastasia Lapsui about the life and history of the Nenets people. On the 30th August 2012 they came to the Arcrtic Centre in Rovaniemi for a preview of their latest film “Eleven human images” (Yksitoista ihmisen kuvaa). This film reflects the worldview of Markku and Anastasia and mix their philosophical ideas, ancient rock art and indigenous culture with avant-garde art and music. 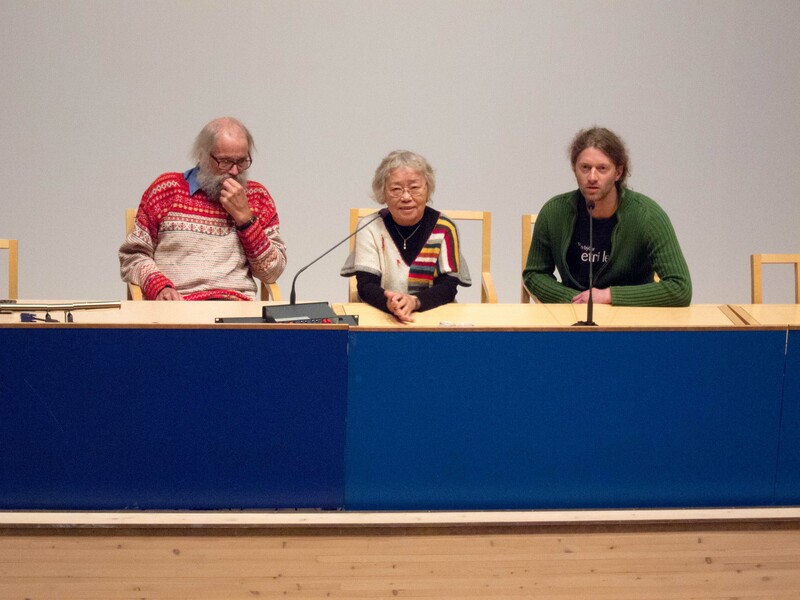 Anastasia Lapsui and Markku Lehmuskallio discuss their new film “Eleven human images” with the public at the Arktikum. Floran Stammler is translating. It’s a major oevre on the history of humankind using rock drawings and carvings from a time range of 50 000 years ago up to 1964. The film was shot in locations all over the world. The authors say that it’s a very personal interpretation of those paintings and how they connect to our present understanding of who we are. It was striking that all of the drawings depicted human-animal relations. The fact that this theme is so overarching tells us a lot how paramount these relations have been for our existence as species on this planet both in pragmatic and spiritual terms. We were left like pondering about these deeply philosophical issues of how much has changed in our relationship with the animals. That’s something that we have been thinking about for a long time when several of us were working on a volume that focused precisely on this theme. 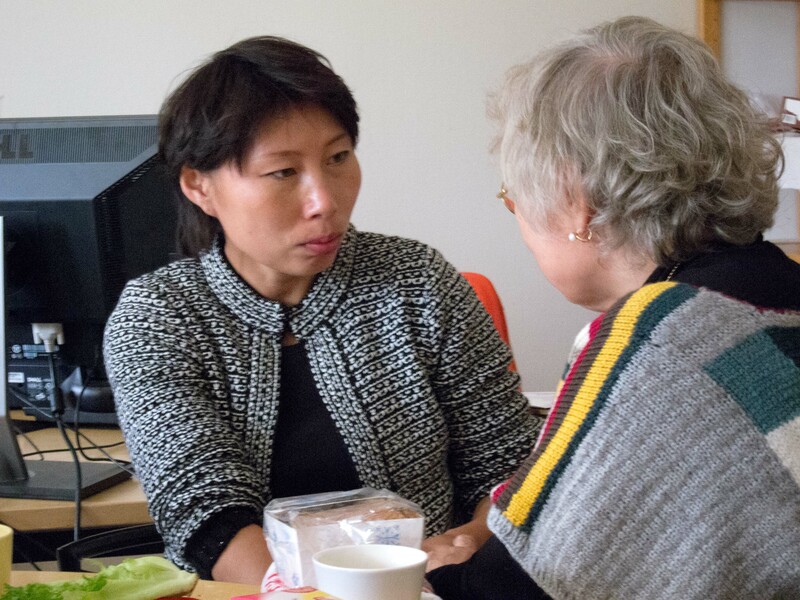 Until recently, these relations have continued to be crucial and in their position for us relatively unchanged, but then neoliberalism alienated us more and more from this relation, an aspect that is at the heart of Hugo Reinert’s work. Anastasia Lapsui emphasized in the discussion how she has been pondering about her own origin and the origin of her people, the Nenets as part of universal humankind since early childhood; so this film is also a powerful statement on her search for her own roots. For the anthropological research team of the Arctic Centre it was a unique possibility to discuss with Anastasia and Markku the collaboration with Nenets reindeer herders and our project of collecting oral history in the North (ORHELIA).We had a lively discussion on how to transport anthropological messages to a visual audience. We were not surprised, that Anastasia’s main interest in our work considered the practical application of scientific research and how the outcome of our project could be useful for the reindeer herders themselves. 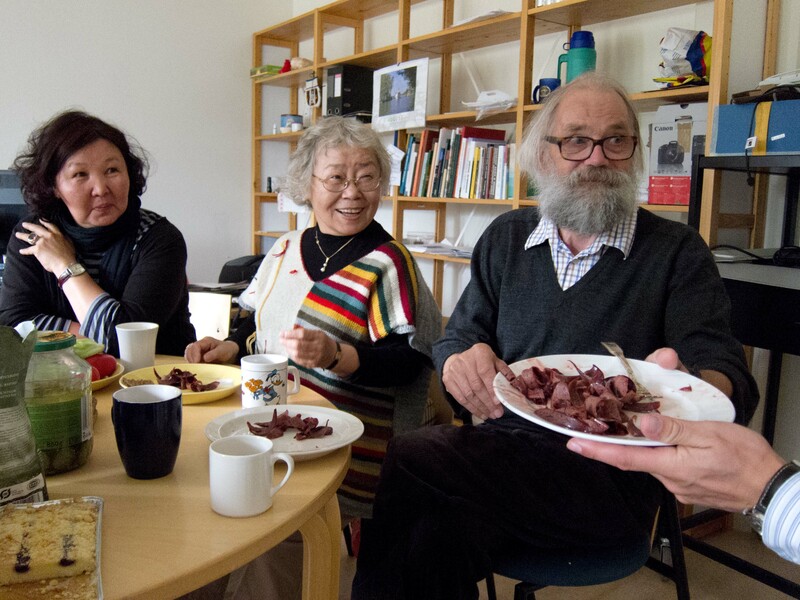 During our discussion we had a very tasty degustation of raw reindeer liver (in the Nenets way), which Florian Stammler bought from a Sámi reindeer herder from Enontekiö here in Northern Finland – so thanks to him also! This entry was posted in All, Guests, Indigenous Peoples, oral history, Spirituality, Theoretical Issues and tagged Film, Nenets, Yamal. Bookmark the permalink. Beautiful, Anasasia and Markku! I wondered where are you and what are you working with now. Anastasia Lapsui and Roza Laptander did not see each other for a long time and they were so happy to meet again.